Israeli soldiers invaded, on Saturday at dawn, several Palestinian districts in the occupied West Bank, searched many homes and kidnapped at least six Palestinians, in addition to summoning others for interrogation. Israeli Navy attacks fishing boats in Gaza. The soldiers kidnapped a young man, identified as Mustafa Yousef Sbeihat, 28, from Rommana village west of the northern West bank city of Jenin, after stopping him at a military roadblock near Ramallah. Sbeihat, a former political prisoner; he was headed back home from work. The soldiers also kidnapped another young Palestinian man, identified until as Arafat Taha, in Qotna town, northwest of occupied Jerusalem. Another Palestinian, identified as Husam Nafez al-Ashhab, was kidnapped from his home in Qalandia refugee camp, north of Jerusalem. In addition, several army vehicles invaded the al-‘Arroub and al-Fawwar refugee camps, in the southern West Bank district of Hebron, searched homes and kidnapped two Palestinians. The two Palestinians have been identified as Rabah Bilal Fdeilat, from al-‘Arroub, and Hammadi Abdul-Fattah Hleiqawi, from al-Fawwar. Several young men, from Kreisa area, west of Hebron, were summoned for interrogation in Etzion military and security base, while the soldiers also invaded Doura and Deir Samet towns. The soldiers also installed many roadblocks in various neighborhoods in Hebron city, Jouret Bahlas area, in addition to Halhoul and Sa’ir towns, before stopping and searching dozens of cars, and inspected the ID cards of the Palestinians while interrogating many of them. Furthermore, the soldiers invaded the al-Khader town, south of Bethlehem, searched homes and summoned Nabil Sleiman Mousa, 22, Hamza Issa al-Kobar, 26, and Mohammad Rezeq Salah, 22, for interrogation in the Etzion. 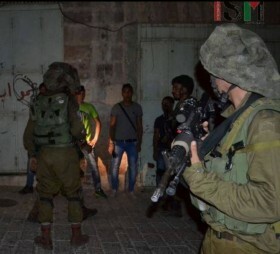 In Bethlehem city, the soldiers searched a few homes and summoned Hamza Mustafa Kanaan, 22, for interrogation in Etzion. In the Gaza Strip, Israeli navy ships fired many rounds of live ammunition on Palestinian fishing boats, in Gaza territorial waters, in the northern part of the Gaza Strip, forcing the fishers back to shore. Also in Gaza, the soldiers opened fire on Palestinian fishers, east of Rafah, in the southern part of the Gaza Strip. On Friday afternoon, the soldiers kidnapped Ein al-Louza neighborhood, in Silwan town, in occupied Jerusalem, and kidnapped six Palestinians, including the head of the Wadi Hilweh Information Center.